Four Nights Only in New York City! Please join us for a special theatre fundraiser benefitting Postpartum Support International as we honor 30 years of excellence in transforming women’s and families’ lives. Starting with a performance by Melissa Bangs’ and her critically acclaimed one-woman show, Playing Monopoly with God & Other True Stories at the Rattlestick Playwrights Theatre. Followed by a light dinner and champagne reception at Bobo. Description: A wine and cheese soiree featuring Melissa Bangs’ critically acclaimed one-woman show, Playing Monopoly with God & Other True Stories followed by a panel discussion with PMAD experts and survivors. Please plan to arrive no later than 6:45pm. Description: A live taping of Melissa Bangs’ critically acclaimed one-woman show, Playing Monopoly with God. Wine and cheese available for a small donation. Please plan to arrive no later than 6:45pm. Description: Mimosa Matinee for Mamas! Join us for a special matinee in honor of all of the wonderful mama’s out there. It will feature Melissa Bangs’ critically acclaimed one-woman show, Playing Monopoly with God. Mimosas available for a small donation. Please plan to arrive no later than 1:45pm. 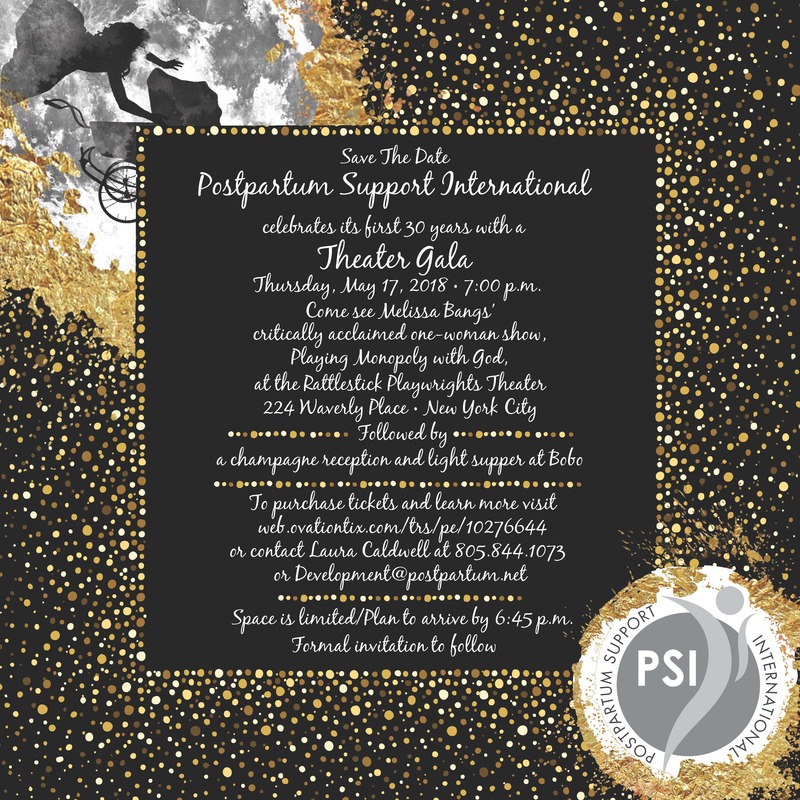 Postpartum Support International has been in existence for 30 years. It is the leading organization devoted to increasing awareness among the public, as well as medical and mental health professionals, about the prevalence and devastation of depression and anxiety during pregnancy and postpartum. Approximately 1 in 7 women will experience mental health issues, including but not only depression, after giving birth to a baby; up to half of those episodes will begin in pregnancy. Untreated, this experience can be damaging to the entire family for years to come. Suicide is the leading cause of maternal death, outside of childbirth itself, in the first year of an infant’s life. Thankfully, there is very good treatment and almost every woman can get well. Unfortunately, no more than 30% get this treatment for reasons of stigma, finances, and lack of knowledge. PSI seeks to change that. It provides direct support to women with this illness and their families, it trains professionals in how to recognize and treat, and it provides a connecting bridge between the two. PSI also disseminates information and resources through its volunteer coordinators in every state and 44 countries, and it advocates for further research, funding and legislation to support better understanding about causes and cures. PSI’s universal message of hope to anyone who is suffering is : You Are Not Alone, You Are Not To Blame, With Proper Help You Will Be Well. To learn more about PSI please visit www.postpartum.net. This is not an ADA-compliant venue. However, we do our best to accommodate any and all patrons. For full notice: the theater sits above a 17-step staircase, our seats are raked amongst 10 steps, and our bathrooms are onstage at the top of 3 steps. Please let us know if you need special accommodations as soon as possible.